if you have any suggestions on material that would make this page even more useful to students and teachers. Ask a question, post a comment, solve entertaining linguistics problems, and interact with others interested in functional linguistics, the English language, or communicative language teaching. Click here for the Understanding English Grammar Facebook Page (requires Facebook login to post questions or comments). Language is primarily a tool for communication, yet many textbooks still treat English grammar as simply a set of rules and facts to be memorized by rote. This new textbook is made for students who are frustrated with this approach and would like instead to understand grammar and how it works. Why are there two future tenses in English? What are auxiliaries and why are they so confusing? Why are English motion verbs hard to use? Why are determiners so important in English? These and many other frequently asked questions are answered in this handy guide. 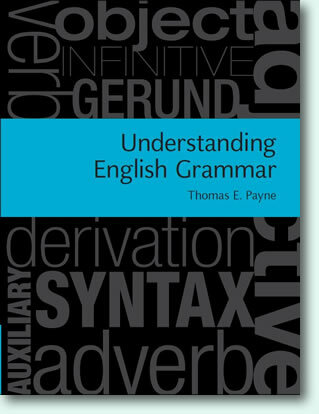 It is the essential grammar toolkit for students of English language and linguistics and future teachers of English as a Second Language. Student learning is supported with numerous exercises, chapter summaries and suggestions for further reading. A useful glossary of terms is included, to help students find stheir meanings easily. An accompanying website offers further resources, including additional classroom exercises and a chance to interact with the author.